Combination Offers give you the best savings! 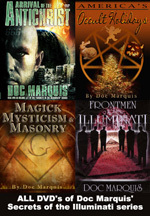 CE-Doc-Combo-DVD-16- Combo Offer DVD: Best of Doc Marquis - Secrets of the Illuminati, Original Six Titles by Doc Marquis, 11 DVDs, , Save Money This item is on sale. 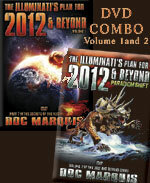 CE-Doc-Combo-DVD-18- Combo Offer DVD: Secrets of the Illuminati, All Eight Titles by Doc Marquis, 15 DVDs, , Save $100.00! This item is on sale. 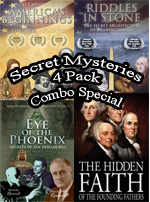 CE-Doc-Combo-DVD-14- Combo Offer DVD: Secrets of the Illuminati, Series of 4 by Doc Marquis, 7 DVDs, over 11 hours of teaching, Save Money This item is on sale. 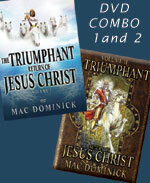 This Combo Offer demonstrates the Biblical truth that the daily battling between Godly Angels and ungodly demons in the Heavenlies determines the flow of history, precisely as Daniel 10 reveals. 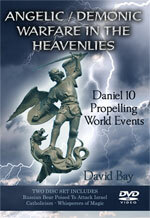 Daniel, Chapter 10, reveals a most shocking daily battling which is occurring in the Heavenlies. Godly angels are constantly battling ungodly demons over who would have control of human leaders. In Daniel 10, two demonic entities are identified as the 'King of Persia' and the 'King of Greece'. Powerful demonic beings were attempting to influence the human kings by this title to pursue Satans plan for them and for their nation; but, Godly angels were fighting to influence these kings to follow God's plan. While God is omnipotent, and could win every battle, in His great prophetic plan, He chooses sometimes to allow the demon assigned to that king to prevail and to convince the king to follow Satans will for that king, for that nation and for that time. This type of supernatural battling in the Heavenlies is occurring every day in these End Times. In fact, no person who does not know about this supernatural conflict, determining how the rulers of nations and of churches and of businesses act, will ever understand the events and issues of this day. 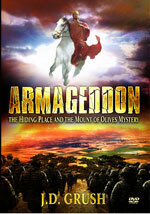 CE-DVD-Grush-COMBO-01-Armageddon, COMBO The Hiding Place and the Mount of Olives Mystery - 4 hour DVD by J.D. Grush - the teacher with the 'Alexander Scourby' voice! This item is on sale. 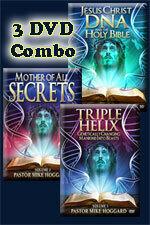 PRM-COMBO-23-DVD-Combo DVD Offer: DNA Discovered In The Bible - Three Videos by Pastor Hoggard This item is on sale. 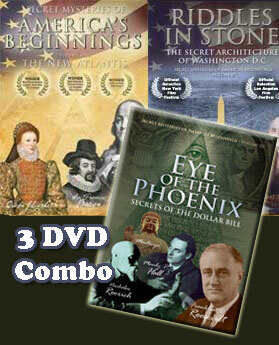 CE-COMBO-1240-Combo DVD Offer: Freemasonry: Fatal In First Degree by Bill Schnoebelen + Magick, Mysticism & Masonry by Doc Marquis - 3 DVD's, Over 5 hours of Teaching This item is on sale. 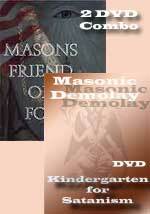 Combo-1229-DVD-COMBO OFFER: Book Masonic & Occult Symbols Illustrated PLUS DVD Masons: Friend or Foe This item is on sale. 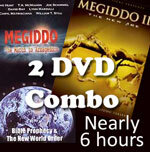 COMBO-Horn-Schnebelen-COMBO OFFER: Book 'TimeBomb' + DVD 'Medical Murder' - You Save $20! This item is on sale. This video unfolds the fascinating history behind the founding of America, and exposes the esoteric underbelly of its design. Why is Washington D.C. build on the 77th Meridian? Are the Revolutionary War cities really built in perfect alignment with Stonehenge? If America was founded as a Christian nation, why are many of its symbols, buildings, and monuments based on Pagan traditions? There is no doubt that Americas cultural national heritage was Christian, but just as a coin has two sides, our national heritage has a second side  one based squarely on occult secret societies and their values. Volume 2 - "Riddles In Stone: The Secret Architecture of Washington, D.C."
Continues to explore the fascinating history behind the origins and focus of the world's most powerful nation: America. Now you can enjoy the "Best of Cutting Edge Radio" programs!! MP3 format will play in your computer or in MP3 capable DVD players or MP3 capable CD player or upload them to your portable MP3 player. You will discover an America which you never realized existed! You will discover that Global Leaders, led primarily by Americans and Europeans, have created a detailed plan by which they intend to create a global dictatorship, global economy and global religion, after which they will stage their Masonic Christ. And, all this will fulfill Bible prophecy exactly!! 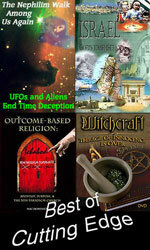 You will be amazed at how thoroughly today's events were planned decades ago! 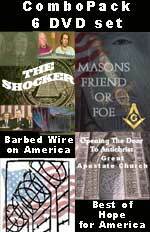 If you purchased each of these radio programs individually you would spend $299.40! You literally save $249.41! 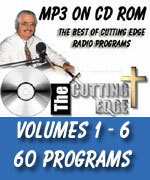 COMBO-17-Cutting Edge Seminars 1, 2 and 4 on MP3 CDROM This item is on sale. 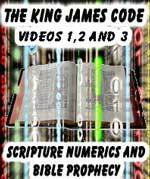 PRM-Combo-21-DVD-DVD - Pastor Hoggards King James Bible Numeric Code Combo Offer, Saving You $15.00 This item is on sale. Combo-1226-DVD-DVD - World Dominion Plus Barbed Wire Over America - Combination Offer! This item is on sale.